This creamy vegan butternut squash soup is a fall favorite! It’s gluten free, dairy free, and nut free, but so creamy and delicious you won’t be able to get enough! Easy to make in your instant pot or slow cooker too! I haven’t met anyone yet that doesn’t love this soup. This soup even won over my husband who previously thought that he hated squash. Why you will love this creamy vegan butternut squash soup! You only need a few basic ingredients. It’s packed with nutrients! There’s over 200% of your RDA of vitamin A! You can make a big pot for only about $2.00 when squash is in season. It’s rich, creamy, slightly sweet and savory. Kids love this soup and eat bowl after bowl! Perfect for Fall or your vegan Thanksgiving Feast! 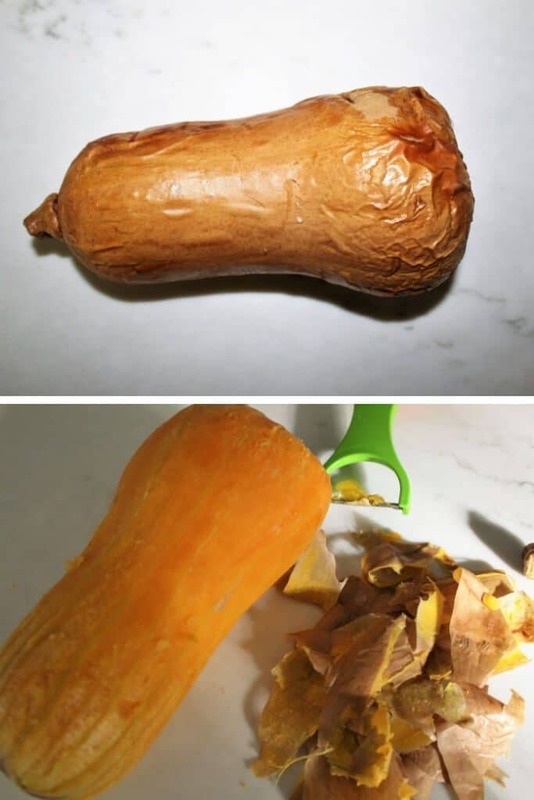 How do I peel and cut a butternut squash? The trickiest part of making this soup is peeling and cutting the squash. Since it is very hard, I cook the squash with the skin on first to make it soft and easier to work with. You can do this in 2 ways, steam it in an Instant Pot for 8 minutes or bake it in the oven at 300 F for about 30 minutes. Either way works well to soften it and make it very easy to peel and cut. 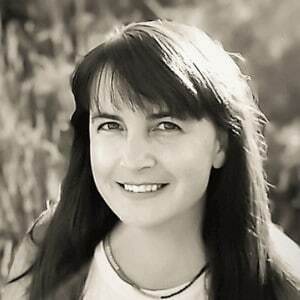 How do I make creamy vegan butternut squash soup? To make the soup, simply sauté onion in some oil on low for about 5-7 minutes until the onions become translucent. Add spices, vegan broth, and peeled and cubed squash. (I like the Not Chick’n cubes to give it a wonderful savory flavor, but you can use and vegetable broth or just more salt). Then boil the squash in the broth until it becomes very soft. (The time will vary depending on the how much the squash softened when you heated it before cutting and the size of the cubes, but it’s usually about 10-15 minutes for me). Add your choice of plain plant-based milk and purée with an immersion blender. If you have a smaller squash, reduce the broth to use enough to just barely cover the squash cubes. Use a metal stick blender to puree hot soups right in the pot. It’s the safest and easiest to make creamy soups. You can also transfer it in small amounts to a blender – make sure to be careful not to overfill the blender or it could spill out and burn you. You can throw your squash in the oven earlier in the day when you have time. It will stay fine for hours until you are ready to make your soup. Buy butternut squash very inexpensively in the fall and store in a cool place like your basement. They will keep for months! This soup tastes great the next day too! Make it ahead and have it ready to heat and serve. Turn this soup into a meal with my cheesy vegan bread sticks or vegan Cheddar Bay biscuits! How can I make this in an Instant Pot? Put a small amount of water in the bottom of the instant pot with the steaming rack. Place the whole unpeeled squash in the Instant Pot and set to high for a minute then release the pressure. It will now be soft to peel and cube. Saute the onions in oil in the pot then add the broth and cubed squash. Put on the lid and set to high pressure for 3 minutes. Allow the pressure to release on its own, then add plant-based milk and puree in the pot with an immersion blender. How can I make this in a Crock Pot? Peel and cube the squash according to above instructions. Put all of the ingredients into the Crock Pot except for the plant-based milk and set to high for 4 hours or set to low for 6 hours. When you are ready to eat, add the plant-based milk and puree with an immersion blender. Want another perfect fall soup? Try this delicious creamy vegan pumpkin bean soup or this red lentil soup with pumpkin and kale! Don’t forget to pin this creamy vegan butternut squash soup recipe for later! A creamy gluten free, vegan butternut squash soup! Peel and cut squash into about 1-inch cubes. Dice onion and sauté on low heat in the saucepan in the olive oil. Sprinkle with salt and herbs and sauté slowly until translucent. Add the water and broth cube (or vegetable broth) and the diced squash. (Use just enough broth to barely cover the squash). Simmer for about 15 minutes until squash is very soft. (This will vary depending on how much you precooked the squash and the size of the cubes that you cut it into). Add plant-based milk of choice like plain soy milk. Puree with an immersion blender until very smooth and creamy. If you don’t have an immersion blender, transfer to a blender in small amounts and blend – be careful not to overfill or contents can overflow and burn you. Reduce the broth slightly for a thicker soup or increase the broth for a thinner soup. 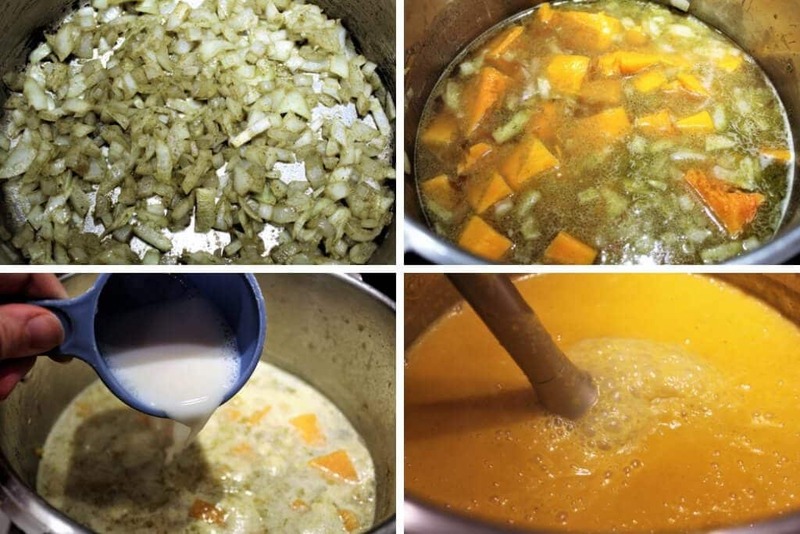 The amount of broth needed may vary depending on the size of your squash. This had great flavor, and your tip about roasting the squash in the oven first was very helpful. I also added fresh thyme instead of the sage because that’s what I had on hand. However, the soup was a bit watery for my taste. I added the four cups of broth, which already seemed like a lot (I did have a smallish squash) and when it came time to add the almond milk I only could add one cup because two would have made it like butternut squash tea. I would advise people to use three cups of broth to start off (especially since sizes of squash can vary), then add a fourth cup only if really needed when it comes time to blend. Then you can have enough room to play around with the two cups of non-dairy milk, because that really does add to the flavor. But overall, I was very happy and will try this again! I just discovered your website and I am VERY excited to try all your vegan cheeses and the vegan yogurt. Thank you for all your wonderful ideas! I’m glad that you liked the flavor. You have to use a large squash or 2 smaller ones to make the proportions come out right. I usually add just enough broth to almost cover the squash. That always gives me the right consistency in the soup after the soy milk is added. I can’t get enough of this soup! So delicious! Thanks for the recipe!